Supreme Allied Commander Transformation, General Denis Mercier, has identified six Focus Areas in order to drive Allied Command Transformation’s innovative outputs: Command and Control, Collective Training and Exercises, Logistics and Sustainability, Partnerships, Capabilities and Human Capital. Within these six areas, Logistics and Sustainability is the one envisioning the long term Comprehensive NATO Logistics Network and Operations Logistics Chain Management is the bridge to achieving this long term goal. It is the capability designed to foster collective responsibility for NATO logistics within 2022 and on which NATO will build the future of sustainment for a fully interoperable Alliance in 2030. Operations Logistics Chain Management is intended to be fully operationally capable in 2022 with the implementation of the related Logistics Functional Service tool set, which will result in a more effective, and efficient, multinational logistic support to NATO operations by reducing duplication of national logistic chains and the competition for contracted resources. 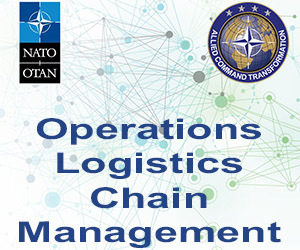 Operations Logistics Chain Management will achieve this aim by giving the Alliance a common platform for collaborative logistic planning and execution, consisting of new processes and procedures, applied to NATO doctrine, and a modern logistics Information Technology tool set that enables all stakeholders to have greater visibility of deployment and sustainment requirements and resources. A key success factor of the programme is the Nations’ willingness to share logistics information and to change the current stovepipe national way of doing logistics, into a real collective logistics approach. The Operations Logistics Chain Management Roadmap was approved by the Logistics Committee in September 2016 and a supporting Implementation Plan, a living draft, was developed to document and track actions needed to accomplish the 52 Roadmap Milestones over the next five years. Exercises such as Joint Derby 2016, the Coalition Warrior Interoperability eXploration, eXperimentation, eXamination, eXercise 2016, along with the Asset Tracking Integration Campaign 2016, provided significant inputs for improving the roadmap and assessing interoperability leading to alignment to doctrine and collaboration with academia and universities in the field of future logistics solutions. In addition, the application of emergent technologies to existing and new logistic initiatives and exploring how the latest developments in these technologies area can benefit future logistics and NATO were the main topics of the Logistic track kicked off during the last Technology for Information, Decision and Execution Superiority, TIDESprint 2016, in Norfolk. Furthermore, In order to have a tool reflecting the Operations Planning Process and capturing the main logistics process at the strategic, operational and tactical level, the harmonized and standardized Logistics Business Processes have been transitioned into an electronic format for use by NATO staff officers, nations’ staff officers and logistic training personnel for implementation and use in upcoming NATO exercises. NATO Doctrine updated with Operations Logistics Chain Management processes and procedures, the Logistics Functional Service tool set, and a supporting Training and Education program will all contribute to NATO conducting collective responsibility for logistics and operations involving both NATO and national staff officers to rapidity work together using common procedures and tools. 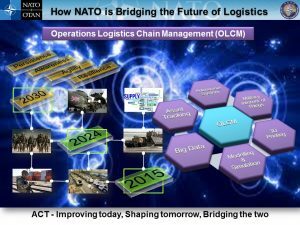 This provides a holistic approach for NATO and the Nations to reliably collaborate, maintain visibility, and manage valuable resources, setting Operations Logistics Chain Management as a bridge linking today’s activity with future sustainment and the long term goal of a Comprehensive NATO Logistics Network.